What the hell was that? Last week I sat here and talked about how surprised I was that Wizards didn’t ban Felidar Guardian, that it was probably a mistake, that Standard was miserable, that there were no financial opportunities, and how our only hope was to see what they did five weeks after Pro Tour Amonkhet. Roughly 48 hours after the initial announcement, Aaron Forsythe posted an addendum that by the way guys, Felidar Guardian is also banned. In a post that Patrick Sullivan charitably described as “intellectually dishonest,” Aaron said that they changed their minds after seeing the first 24 hours worth of MTGO Standard leagues and how they were still all Copy Cat. Bulllllllllllllllshit. They had thousands of data points leading up to that, but the very first constructed league results — events that were guaranteed to be won by Copy Cat, because people hadn’t even had time to buy new cards, much less brew and test new decks — are what changed their mind? What actually happened is that they saw how angry people were and decided that while their decision not to ban had been because they were concerned about eroding player goodwill, it was immediately clear that they were doing even more damage by leaving Guardian unbanned. So off it went. Now with the first SCG Open in the books, things are looking cautiously rosy. Mardu Vehicles won the whole shebang, to the surprise of no one, and took five out of the top eight slots. Don’t let this fool you. It’s not shocking that the best deck in the format won a day-zero event full of untested and untuned lists. It will take until the Pro Tour for the Vehicle crushers to fully be realized. To wit: as soon as you got out of the top eight the decklist variety explodes. It’s unlikely that the Pro Tour and ensuing metagame will look too similar to this, but it’s a refreshing to have something to look forward to after the last few months of a brutally stale format. Did you also forget that this card exists? Because I did. Five mana Planeswalkers have been stone unplayable up until now, with both Gideon and Felidar Guardian available at four. Now that you run much less of a risk of dying if you tap out on five, Planeswalkers like Nissa and Liliana, Death’s Majesty are much more viable. Both were found on the tables this weekend, and while not in the greatest concentration of play, that doesn’t mean there isn’t room for growth here. Nissa in particular is a remarkably tantalizing $4. There aren’t many Planeswalkers that come and go with a price tag that low. Nissa would have to be in the bottom quartile to fare so poorly. Looking at those abilities, I don’t think that it’s likely to be. Her first ability, while not as obvious as Gideon’s on first pass, actually does protect her. The land she animates stays animated until your next turn, not the end of the current turn. Your 5/5 land gets to play blocking duty if need be. And since the +1 untaps the land as well, it means you can tap out on turn five (or four) and still protect her. You’ve then immediately got the option to ultimate her, which will draw you multiple additional cards over the course of the game. If you don’t choose to go that route, you can still set her up to keep returning the most dangerous threat in your graveyard every few turns. At Atlanta this weekend we saw Nissa in the sideboard of G/R Energy and G/W Tokens decks, as well as sprinkled elsewhere. This is hardly a commanding position, but that’s that’s because this article series looks at cards out on the horizon, not at what’s already cemented as a format pillar. Perhaps what’s most intriguing about Nissa to me is the fact that she’s in Kaladesh. Which means that she doesn’t rotate in five months, like the Battle for Zendikar and Shadows Over Innistrad blocks. No, she rotates in 17 months — the fall of 2018. That gives Nissa quite a long time to hit her stride. 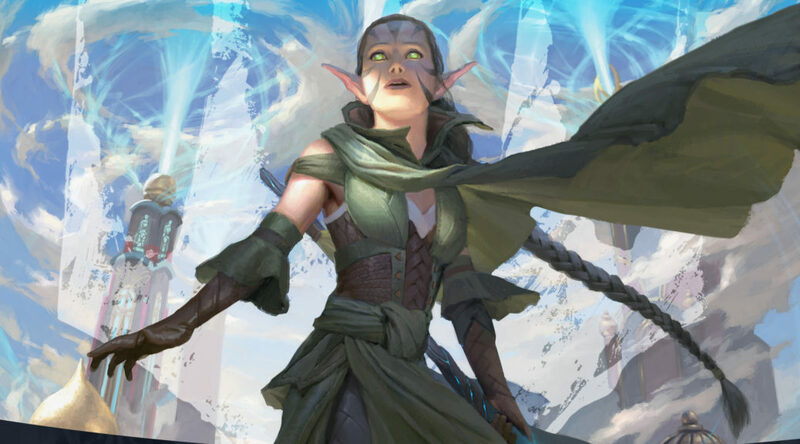 When Ixalan rolls around this fall and Gideon and all of SOI take off, there’s going to be a chance that Nissa hits it big. Mardu Vehicles. B/W Zombies. Mono-Black Zombies. Mono-Black Aggro. These are some the decks running playsets of Scrapheap Scrounger this weekend, and that’s just the lists on the first page of results from the Open. It quickly became clear, several months ago, that Scrapheap Scrounger was a fairly real card. Modern Dredge had picked him up quickly, and anyone in Standard that wanted to attack with less than an infinity of cats was probably in the market for him as well. After this weekend, there’s no doubts whatsoever that we can expect to see Scrounger as a major part of Standard moving forward. As far as determining whether or not a deck has Scrounger in it, the decision tree seems to be fairly straightforward. A. Does the deck make black mana? B. If yes, does it want to kill its opponent dead? If you answered yes to both of these, chances are that Scrounger is there. Two mana for a 3/2 is a reasonable enough rate, and when combined with the fact that you get to do it over and over again, it quickly gets out of control. Scrounger completely invalidates many of the format’s premier removal spells, such as Fatal Push, Unlicensed Disintegration, and (soon to be premier) Sweltering Suns. Aggro decks are often looking for key cards that help them crawl over the finish line, and a threat that keeps recurring through removal spells is about as good as it gets. Scrounger has a few things working against him. He’s a rare, rather than a mythic, and he’s from Kaladesh, a heavily-opened fall set. That said, he rarely shows up as less than a full playset in his respective decks, and it looks like there are a lot of lists looking to scrounge. I fully expect the large variety of decks this past weekend to consolidate in the near future, especially after the Pro Tour, but that doesn’t mean there will be any less Scroungers. At around $1 or $1.50 a copy, we could see Scrapheap Scrounger make a real run in this new Standard, and if not this season, then in October when the prior year’s fall set experiences its peak. Given the numbers of Scrounger we’re seeing already, it’s hard to imagine he’ll make it to this time next year without having taken a ride at least up to $5. Remember Sphinx’s Revelation? That dang card was $30 at one point. It drew you a boatload of cards and undid your opponent’s last attack step (or three). It was Standard. Now we’ve got Pull from Tomorrow, a card clearly scaled back from Sphinx’s Revelation. While it costs on less mana, it also draws one fewer card and, most importantly, gains no life. Having to discard a card at the end of the spell is probably mostly inconsequential (how often did you need every single land from a Revelation), but the lack of any sort of line gain is sure to hamper the card. And yet, we’re seeing a recent upturn on the price of Pull. It looks like some time Saturday evening or Sunday the $2 copies began drying up, likely in response to the fact that people were playing with it at the Open and actually winning games. Now we’re in an interesting position where people are trying to figure out if it’s going to break out at the Pro Tour. If it does, expect to see the price triple. Having your copies on hand ahead of the PT will be a humongous boon if that happens; ship them Sunday and Monday Morning without hesitation and enjoy whatever profits you find. Will Control make it back into Standard? I don’t know yet, and nobody save for maybe Wafo-Tapa does either. After a reasonable first weekend though, and rumblings of control’s return detectable on Twitter, I’m certainly keeping a close eye on what Tomorrow holds.